Sweetie Belle pranced merrily towards the Carousel Boutique, the little white unicorn in a good mood. Mucking about in the wet mud hadn't gotten her a mud-themed cutie mark, but that was all right, she supposed. It was fun enough, but she wouldn't want to play in the mud *every* day. She paused at the door to wash her hooves carefully, mindful of her big sister Rarity's admonitions to never come into the Boutique with dirty hooves. Then she pranced merrily in, her pink and lavender hair bobbing with each step. Her hooves were spotlessly clean - but the rest of her was splattered with mud from nose to tail. She hummed the mud-song she'd come up with for MudBug merrily as she pranced, the bouncy tune fitting in well with the movements. squelch underhoof as I trot all around! Blub glub plop, little squishy mudpit! what is as fun as this wet sticky ground? The mud even seemed to be into the music, falling off of her to splatter on the floor in time with her humming, as she pranced past her sister, leaving a long trail of mud behind her as she went looking for the picnic basket she'd prepared earlier. Rarity was hard at work on another order for Hoity Toity, and it was going so well! While more... shall we say... universal designs were required for this order, the unicorn had taken most marvelous inspiration simply from watching all of the citizens of Ponyville, and was currently working on touches that accentuated the wonderful wings of pegasus ponies without interfering with function. Something that would float gracefully about pinions in flight without endangering the flier! Something that became an entirely new outfit when pegasi took to the air, a wonder on the wing! She would have to have her winged friends try it out, of course, but as far as she could tell it was working out marvelously! Rarity barely heard Sweetie Belle come in, though she caught the tune. A second or so later and she was humming along, clicking a hoof against the floor now and again. Her little Sweetie was so talented! Of course, it did run in the family. Rarity smiled, bobbing her head lightly and stitching along to the beat of the song. Rarity froze, ears going back. One ear twitched every time a mud drop hit the ground. Soon an eyelid was twitching with it. Slowly - dread rising from her very hooves - slowly she raised her head, eyes focusing on the mud trail and the dirty little foal leaving it. It was a moment before she could close her dropped jaw, and she tried to call after her sister. She couldn't quite get it out. A moment to gather herself. There. That sounded firm and strong and not at all hysterical. "Sweetie Belle! What! Are! You! Doi-i-i-i-i-i-ing?!" Her voice had been rising in pitch as she spoke; the last syllable was drawn into a shrill, staccato wail as she drummed her forehooves against the floor, quite unable to contain her anguish. Deep breaths, Inkwell. Deeeep breaths. That's what he told himself as he approached Carousel Boutique. He'd noticed the building a few times since he came to Ponyville, but it wasn't until today that he'd heard who lived there. Not that he hadn't heard OF her, of course; he'd picked up snippets of conversation about the classy unicorn who designed dresses. He'd seen a few impressive pieces of her work on display, and his conversations with their owners made him quite enthusiastic about meeting their creator, Rarity. He didn't really know why he needed to breathe, why he felt just a bit nervous. Maybe it was what he heard about how classy and genteel she was that made him fret. Well, he could be pretty charming himself, or so he'd been told from time to time. And he'd just recently been to the spa, for reasons that included impressing Rarity (not to mention indulging himself and getting pampered). His thoughts briefly wandered to the flyer he'd found for another boutique in Ponyville (Good heavens, the town has two of them!) when he came to the front door and noticed a prominent trail of mud leading up to it, ending on the welcome mat. How very strange; he specifically heard that Rarity was fastidiously clean, too much so to let her hooves get this muddy. A moment's pause was all he gave the idea, though. He opened the door and pushed inside, closing his eyes and taking a whiff of the delightful scent of lilac. It must have come from some sort of perfume or shampoo; he'd have to ask her where she got it. "Greetings, miss Rarity," he said, "I've been looking forward to meeting OH MY WORD." He'd chosen that unfortunate moment to open his eyes, prompted in part by the sound of Rarity's increasingly high-pitched voice. It took a few seconds for Inkwell to focus on Rarity, as he found his attention arrested by the mud-covered beast they shared a room with. No, not a beast, it had clean little pony hooves, though rivulets of mud dripping down made them less so by the second. It left a trail from the door, and Inkwell considered himself fortunate that he didn't step in it when he walked in. Was this little urchin really so inconsiderate as to track mud in such a classy place? Rarity herself, of course, looked almost every bit as regal as she expected, except she was understandably distressed at the moment. Her hair was even silkier than his, and it curled like a ribbon to boot! Inkwell didn't even know that was possible! "I-I'm terribly sorry, did I come at a bad time?" he asked. He couldn't think of a better way to handle this rather awkward situation. Sweetie Belle jumped in surprise at Rarity's exclaimation, her eyes going wide. "I... I'm just g-getting my lunch basket!" she cried, looking startled. "And I gotta clean up b-before we meet up!" She wasn't sure why Rarity was getting to upset... it always seemed Sweetie Belle was doing something to get Rarity upset, but she didn't know what. Well, OK, the other day it'd been accidentally knocking over the dress form that Rarity had been using. And the day before that, she'd tried to make Rarity a new pattern of cloth, and had gotten the loom tangled up, and Rarity had spent half an hour fixing it up. And two days before that, she'd tried to make a nice snack for Rarity, and had gotten flour everywhere. But those were all accidents! She hadn't done anything wrong! She looked down to check her hooves, quick... lifted them up one at a time - one, two, three, four - the mud was starting to drip down, but they were still mostly clean! She should be able to clean up before her hooves were messy again! She turned around to look to Inkwell. "Oh, no!" she responded to his question. "Big Sister Rarity is *always* ready to help you look wonderful! It's never the wrong time to be beautiful!" She smiled sweetly and confidently. "Sweetie Belle!?" Scoot yelled loudly outside the Carousel Boutique, "SWEEEEEEEEEETIE BELLLLLE" She poked her head in the door and wriggled in past a beige unicorn, bumping into him but not noticing him at all. "Sweetie Belle!" Scoot tackled her friend who was covered in mud, getting it all over herself too. As she got up and shook some mud off of her wings Scootaloo casually looked up at Rarity as though nothing was wrong "Oh hey Rarity!" and then right back to Sweetie Belle "Hey I've been looking for you! wanna go on an adventure?" Scoot was completely oblivious to the mess she was making. Rarity's shock was broken by the sound of Inkwell's voice, and she looked at her guest in thinly veiled horror. Someone was here! Seeing her shop like this, with these filthy little mudsplatters all over the place! There was a time and place for mud, of course - the time was 'when Rarity is not around' and the place was 'far away from Rarity' (unless one was talking facials, but that was neither here nor there). All right. She couldn't fault Sweetie's response to Inkwell's question. She was a smart little foal - so why was it so hard to learn to not track mud? "Please excuse me," she said to Inkwell - smiling, peeking over the rims of her glasses with lashes lowered just so. "I'll be right with you, because my sister is right of course! I just need to speak with her a moment and then we can get started. Thank you so much for your patience!" That said, she trotted briskly to Sweetie, stopping just out out reach of any muddy nuzzles. "Sweetie Belle," she said slowly - carefully! - as she looked the foal over. "You're... quite right... that you need to get cleaned up, darling! But... ah... have you noticed what you've trailed all over OH GOODNESS!" Then Scootaloo shook her wings, spattering mud on Rarity's pristine pearl coat. For the second time in less than five minutes the unicorn was frozen in shock. At least this time she couldn't really see; her glasses were mudspattered too. She was afraid to remove them. "Children," she said after a long moment. "I think... well... Sweetie, don't you think you and Scootaloo might have more fun outside?" Her voice was controlled, but it was tenuous. She was fighting another outburst. Oh her beautiful coat! Her beautiful shop! Oh how COULD they?! Big Sister? That actually explained a lot, like why the little filly was so comfortable in the shop and why Rarity knew her name. He furrowed his brow, remembering when he was Sweetie Belle's age and he decided to help his father with the family business. Twelve broken slates later, he'd been forced away from the work, and he cooped himself up in his room for the rest of the day. His parents always found him underfoot, and he suspected that Sweetie Belle was like that, too, especially given that she piped up to give a good word to her sister's business. Seems it was a friend of Sweetie Belle's, and if Inkwell had to guess, this wasn't the first time she'd just barged into Rarity's shop to see her playmate. Inkwell rolled his eyes and decided to take a look around the shop. Mud trail aside, it looked nice and classy. Sort of had an old-school, aristocratic feel to it. The dresses on the mannequins didn't look half bad, either. He felt drawn to one in particular, a rather vibrant thing that looked as if it were made of spun rubies. A closer inspection revealed that it was a special kind of thread, but there did appear to be rubies sewn into the hems. This was going into the sketchbook for sure! Sweetie Belle was so confused... something was going wrong, she just knew it. Even though she'd carefully cleaned her hooves, something was wrong. Rarity was being so careful with her speech, just like she always was when she needed Sweetie's help the most! There was a frozen moment as she looked up at Rarity, seeing those telltale twitches along her flanks, her front legs, and imagining her eye twitching behind the muddied-up glasses... a moment of dread and apprehension. "Don't worry!" Sweetie Belle hurriedly assured her sister. "I won't go out and play till I help clean this up!" With that eager declaration, she turned and galloped her tiny-little legs off through the shop and into the back room where she knew the cleaning buckets were kept. And leaving a trail of mud splatters in her wake. She was back there only a couple moments before two buckets slid out through the door, sliding halfway across the room, splattering the trail of mud on the floor further, the yellow wash rags flopping on the sides of the bucket, and then Sweetie came galloping back out. She, herself, was all clean again, and she carried a wash bucket on her back. She hurried back out, the soapy water sloshing up the sides of her bucket, as she hurried back to the rest of the group. Her little hoof hit a patch of mud, and ... slipped ... the lil' foal tumbled down onto her chin, letting out an *oof! * The bucket catapulted off her back, turned over in mid-air, and landed atop Rarity, perched cockeyed on her horn, drenching the fashion pony in soapy water, sending a wave of soap and mud across the floor and splashing up onto the nearby outfits. Scoot looked up at Rarity again after Sweetie Belle said "oh no". Oops, she must have gotten mud on Rarity when she shook out her wings. Weird though, Rarity usually loved being all covered in mud at the spa, why was this making her all upset. "Uhhhh sorry Rarity!" Scoot said quickly and stepped back a few feet, getting more mud all over the floor. She was beginning to wonder if Rarity's eye twitching had to do with the mess. "I'll um... I'm gonna help too!" with that Scoot ran off to grab the other bucket of water as soon as it slid out into the room, mostly to get away from Rarity who was starting to look really twitchy and scary. Before Scoot got over to her bucket Sweetie Belle tripped and spilled water all over the place. Scoot started to slip on the soapy water and tried using her wings to keep her steady, that took all of her concentration. While distracted she wasn't looking where she was going and slid right into a mannequin that had half a dress on it, knocking it over... right into her bucket of water. Unlike Inkwell, the two foals didn't wait for Rarity's permission to help clean up with everything. They just rushed for the cleaning closet and got buckets of water to fix everything, or so they thought. At least the white foal was clean again. "Um girls you really should watch where you're going with those!" he sputtered in a panic, right before Sweetie Belle failed to be careful with her water bucket and slipped. Her hoof streaked mud on the floor and got her dirty again, sending water in a graceful arc towards Rarity and several outfits. His jaw dropped; he couldn't believe the calamity this destructive pair had unleashed upon this innocent dressmaker. Wait. Where was the orange one? Inkwell looked around frantically only to find her slipping on a puddle of water, headed in the direction of a nearby mannequin. And a full bucket of water stood between him and said mannequin. "GYAAAAAH!" He made his best attempt to leap out of the way of the deluge, but it manage to splash his hindquarters, completely soaking his tail. A quick check behind him revealed that, to his horror, some water had gotten on his saddlebags. "No no no no no no no no," he muttered, his eyes wide with fear, as he desperately tried to clean up the bags, using his magic to squeeze water out of the fabric. He checked inside, and to his relief, most of his materials remained dry, except for the sketchbook that slid to the rear of the bag. A quick examination revealed that, to his horror, that edge of the book was damp. The water had penetrated as much as half an inch toward the center in places. Where it touched his inked drawings, it blotted the ink, blurring detail and warping paper. The sight of such damage made Inkwell's already light-colored face turn a ghastly shade of white. Almost as quickly, though, it shifted to red as he regarded the reckless, thoughtless foals who caused his work such misery. He glared daggers at them and gritted his teeth. "Both of you!" he shouted in a surprisingly harsh voice. "OUT!" He pointed a hoof at the door. "NOW!" "Sweetie, no, I don't need--"
Too late. Her sister was already off and running. At least the child had the grace to be clean when she returned! Rarity skittered back from Sweetie Belle's rather enthusiastic cleaning, eyes wide as she peered over her glasses. Oh no! Now Scootaloo was in on it! "Sweetie, please be careful! I don't want you to...."
Fall. She groaned as the foal started to slip. Then she SHRIEKED as the bucket landed on her, soaking the curl from her mane and tail and leaving her coat a mess of muddy suds, her glasses whisked away by the torrent. She heard Scootaloo's crash and turned just in time to see the mannequin go down, water splashing across what was left of her shop in an inexorable wave. Rarity turned very slowly to the foals, reddening skin very apparent beneath her pale, damp coat as the unicorn trembled with rage. She took a breath to speak. She was really going to let them have it! Then Inkwell beat her to the punch. She turned - very slowly, even moreso than with the foals - to stare at him. The NERVE. Taking THAT tone. With HER sister. In HER boutique. She gave Inkwell a long, withering look, eyes narrowed as she stepped smoothly between him and the girls, removing the bucket from her head with a graceful toss. That gaze remained on him a long moment before she spoke, voice cool. "I apologize for harm done to your belongings, and will compensate where I am able. However. I will also thank you to never take that tone with my sister or her friends, least of all beneath our own roof. I think it best you come back later, sir. Good day." Clients were clients and messes were messes - but Sweetie Belle was also her Sweetie, thank you very much! Sweetie Belle gasped, one hoof lifted up before her, staring around in horror at the mess that had happened ... all because of her. Mud and soap and water everywhere, ruining Rarity's gorgeous dresses, and worst of all ... all in front of a customer! Her lower lip trembled as she stared around in horror. There had to be a way to fix this, to put it right! If only... if only... a tiny spark formed at the end of her horn, but poofed into nothing. No magic would spontaneously manifest for her, to put this right. She tried to say something, to assure her big sister that she'd fix it, somehow, but the words caught in her throat, which felt all tight and choked off. Nothing but a tiny squeek came out, her tiny lil' form shook as she tried to figure out how it'd gone all so horribly wrong *again*. And then the customer was yelling at her! That's the worst part! Her big sister's customer had gotten caught up in it! And the most important thing about a boutique was to make sure that the customer was happy and felt special and wonderful! But Rarity was yelling at the customer for her sake! It's my fault, I made the mess. Please, let me make it up to him. What's important is the customer, she tried to make herself say. But her tight throat only let out a squeak of an "Iiiii!" and then she felt a faint sob cut off the words. No, no sobs! That's not what she wanted! She wanted to be special, and good with customers, like her big sister! But then another sob pulled itself from her, and a big wet tear welled up in the corner of her eye and rolled down her cheek. Oh, oh no, oh no! She had to get out of here before she made everything worse! Just be careful, say the words calmly, then turn and walk away with poise and dignity. She could do it. "I-... I-..." Her little voice broke. "I'm SOooORRRRRRRy!" she bawled, "All my faauuullllt!" More tears were welling up to roll down her cheeks, and she turned and her little legs and little hooves churned quickly to hurry her off towards the back room, devastated at one of her more spectacular failures. Scootaloo picked her head up and looked around, there was water all over a few dresses, the beige pony, rarity... it was pretty much all over everything. It was hard for her to believe such a big mess was made by accident while trying to fix a mess. The little foal stood up and looked over at Rarity, she was about to say she was sorry when all of a sudden the other pony started yelling. Quickly turning her head around in the other direction she glared at him and was about to open her big mouth when Rarity stepped in front of her and started yelling back at him! Scootaloo was a little confused why he was in trouble now, not her, but she wasn't going to complain. After the yelling was over it was clear that Rarity just didn't like anypony yelling at her sister or... at Scoot? really? Before little Scootaloo had too much time to think about it, she got snapped back into reality by Sweetie Belle squeaking. Scoot started walking over to Sweetie while Rarity was glaring at the customer. Before Scoot got to her she had already started crying and ran away. Once again she looked at the beige pony and shot him a mean glare "Look what you did!" she screamed and her voice broke a little bit. Unfortunately she didn't have time to see the consequences of her words because as soon as she said it she ran off to the back room after Sweetie Belle, tracking a little more mud around the shop as she went. When she got to the back, Scoot found Sweetie Belle crying, gave her a big tight hug and didn't let go. 'It wasn't all your fault, it was my fault. I jumped on you and made the mess worse, and I made Rarity even more upset. So stop crying, ok?' Scoot herself looked like she was about to cry because she hated seeing Sweetie Belle cry and felt like she was responsible this time. Scoot felt like she was suppose to keep Sweetie Belle from getting sad but this time it was her fault and she didn't know what to do other than keep hugging her friend. The rage Inkwell felt at his art being tainted dissipated almost immediately. Even before everypony turned on him he knew that he'd ruined everything with a few seconds' loss of control. His face reverted to a pale white color when Rarity stepped in front of her sister and affixed him with a glare of her own, equally fixed but far more justified. "I- I didn't mean- I'm s-" he stammered, his voice curdling against Rarity's. He'd put so much effort into putting his best hoof forward, making a good impression on a fellow artist and making a new friend. Now his new friend despised him, saw him as a foal-hating monster, a threat to her family. The other foal yelled at him too, making him weak in the knees. He could barely take a step back and cower before them without collapsing. As tears welled up in Sweetie Belle's eyes, Inkwell felt his own growing moist and blurry. She sobbed in a voice that would break the hardest and coldest of hearts, let alone Inkwell's. He couldn't take it anymore; he galloped out of the boutique as fast as he could, running back to his room to cry about his mistake in private. In his haste to leave, he forgot to pack his sketchbook back in his saddlebags. It lay on the floor of the boutique, thankfully feet away from the puddles of water, but opened right in the middle, of a majestic, fully-inked drawing of a griffin airship hovering over Ponyville. It extended to the very edges of the page, into the wet edge of the sketchbook. Rarity's cold stare remained on Inkwell as he fled, the unicorn's ears flattening against her skull as she heard her poor little Sweetie Belle crying. She stood still a long moment once he was gone, taking a few slow, deep breaths to compose herself. Then she switched her sign to CLOSED and turned to survey the damage. One thing was certain: she was not going to be visiting Hoity Toity's order today. Well - fine. She'd made sure to give herself plenty of leeway this time. There was plenty of time to start fresh and have the dresses ready before deadline. For now, there were foals to attend to, so Rarity turned to head to the back room where Sweetie and Scootaloo had gone. As she walked, her hoof came against the abandoned sketchbook; she blinked, gazing down at the image a long moment. Well now! It certainly was a shame to see such a thing damaged, and she did feel for the artist. Still, it was no excuse. The sketchbook could be returned later; Sweetie first. A moment more to admire the image and she flipped the book closed before levitating it into a drawer for safekeeping. That done, she finally approached the foals. Rarity gazed down at Sweetie, and Scootaloo's attempts to comfort her, for a long moment. Then she smiled, kneeling in front of her sister and nuzzling her just below her nubbly little foal horn. "Well! I don't think those designs were working out anyway, do you? I needed to make a fresh start of it anyway. For now - what would you girls say to taking a break for the afternoon and heading out to the spa? We'll bring Apple Bloom too if she'd like!" Sweetie Belle buried her face into Scootaloo's neck, sobbing her little heart out as her best friend comforted her. She tried to stop, to tell Scootaloo it wasn't her fault, but she just couldn't get the sobs under control at first, and it all came out as incoherent wails. It was even worse when her Big Sister Rarity came in, to try to comfort her as well, by telling her the dresses weren't really all that good anyway. That was impossible! "Nuh-no that's not tuh-true"! she sobbed, "Yuh-you're always puh-perfect!" And before she could stop herself, the words started tumbling out. "Yuh-you're *always* puh-perfect! And I'm always suh-soooo clumsyyyyy!" she wailed. "I'm nuh-never gonna get my fashion cuh-cutie mark! And I'm nuh-never gonna be able to ruh-run the boutique wuh-with you as glamour fuh-fashionista sisters because I'm suh-soooo clumsy and you're so perfect and I'm nuh-not good at ANYTHING!" She let out a fresh set of wails at having finally shared her secretest, most scariest fear, burying her face in Scootaloo's neck again. Scoot wasn't sure what to do at this point, usually Sweetie stopped crying when Scoot hugged her. This time that wasn't working and she just kept crying and blaming herself. Already on the verge of crying it was getting very difficult not to, even though she was trying to hold them back a few tears rolled down Scootaloo's cheeks and ended up somewhere in Sweetie Belle's mane. She felt completely responsible for this, if she had only paid attention to what was going on before jumping on Sweetie then the mud wouldn't have gone all over. Sweetie could have just washed it off and the two of them could have gone crusading, but now she made Sweetie Belle cry and ruined Rarity's dresses. Scoot stopped fighting and just buried her head in Sweetie's mane and cried. Rarity blinked, taken aback. Then she smiled, leaning forward to nuzzle her sister again. "Oh, Sweetie. That's simply not true you know! You're quite good at singing - why that little song you were singing as you came in was as good as anything I've heard from grown-up performing ponies! It was simply wonderful and I would like to hear all of it. And do you remember those little capes you made for the Crusaders? Why, those were simply darling!" She decided not to mention the... interesting... talent show costumes. "In any case. Why, I should show you some of the designs I had at your age. I think you could use a good laugh. And... urgh... what I came up with in Cloudsdale. NOT one of my finer moments, I assure you." Rarity would, in fact, rather forget the entire incident - but she wanted her sister to be happy too. Besides, now Scootaloo was crying as well and she was certain the little pegasus would enjoy some of her... less inspired moments. In fact, she turned to give Scootaloo a little nudge too. "Now, dear, I simply won't see this from you either. After all, if you and Sweetie are like my friends and me, then you're practically sisters, aren't you? And what would that make the two of us?" She beamed at the pegasus, head tilting. Oh she hoped this would work! She wished she had some of Fluttershy's way with 'little creatures' right now! Sweetie Belle snuffled softly, looking up at her big sister, trying to keep her lower lip from trembling... "I don't remember you being the same age as me..." she says softly, her voice sounding a bit quavery. But she did look curious. "Were you really as clumsy as me?" Then she perked up a little. "Was I singing when I came in? Oh!" She perked up a little more, as she tended to do when talking about music, though her sadness was replaced by shyness. "Oh, well, I just made it up! It's not all that good, just a silly little song ... but there was this nice pony named MudBug that I met, and she has *mud* as a cutie mark! And she let me help her prepare the dirt for a garden, and when I was stomping through all that mud and muck, it sounded like music! So I just came up with words to put to the music of all the squelching!" you still stay wet and and cool all the day! And with that, it was like it all never happened... the rapid ups and downs of little children... devastated one moment, and happy again the next. Scootaloo looked up at Rarity, she still had tears in her big purple eyes "Um would that make us like... sisters?". She felt a little better looking at Rarity smile like that. Scoot couldn't be positive but she was pretty sure Rarity wasn't angry anymore. Before Scoot could think about what happened anymore Sweetie Belle started singing! As she listened to Sweetie sing she felt better, she felt like everypony forgot about what just happened. "Sweetie Belle that was awesome!" Scootaloo perked up a little more "so... the whole reason I came over here Sweetie Belle, was to find you to go crusading, do you still want to go today?" and just like her best friend it was like nothing happened. "Exactly!" Rarity chimed in response to Scootaloo before looking over at her sister. The unicorn's ears ticked gently in time to the song's rhythm as she listened to Sweetie Belle sing, and when she was finished Rarity clopped her hooves in polite applause. "You see? That's wonderful! Now. As to my... earlier days... I'll show you pictures from those once we're all cleaned up, all right?" Oh the sacrifices she made for her sister! Those pictures deserved to be burned! Or buried! Or burned and then the ashes buried! Rarity kept her smile, though, stepping a bit back from the foals to start shaking water from her mane and tail. "Now then. Who would like a hot bath? I have some lovely bubbles I've just gotten my hooves on!" Sweetie Belle smiled softly to her sister, and her best friend. They were always so nice and encouraging, even though they keeped focusing on her music. Why did everyone always seem to want her to sing? They were just her silly little twiddles, nothing special about them. Sweetie Belle smiled happily to Scootaloo. "Of course! I love trying to get my cutie mark with you! But today maybe we can do something different? Like... Cutie Mark Crusaders Cleanup, or Cutie Mark Crusader Spa Treatments!" She gave a lil' wink to her Big Sister Rarity. "But you always told me, Big Sis, that whenever there's a mess, we shouldn't go off and do fun stuff till the mess is cleaned up! That cleaning up a mess takes first priority! We should clean up here, first, before going to the spa! 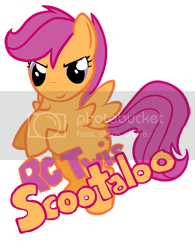 Scootaloo and I can help you!" At this point Scootaloo was feeling a lot better about everything, from now on she would pay more attention in Rarity's shop. As long as she was more careful everything would be fine, they'd clean up the mess and maybe all 3 of them could go on a cutie mark crusader adventure... even though Rarity already had hers. Usually the cutie mark crusaders went on all kinds of adventures but they'd never tried cleanup crew OR going to the spa before. "Both of those adventures sound like a good idea!" She smiled, although Rarity wasn't really her big sister she felt a little like part of the family right now. Scootaloo looked up at Rarity "what should we clean up first?" "Why, you're absolutely right, Sweetie!" Rarity laughed, nodding. "After all, a mess left alone will only get bigger!" She smiled as she listened to Scootaloo. Adventure, hm? Well. She could think of something the girls might like. "Well, the first thing is to get all the excess water off the floor. Cleaning the floor is what we do last, of course - but the first thing is to open the doors and use brooms and rags to chase the water out." Rarity trotted over to open the door so she could demonstrate - with a broom, the water could be scooted across the floor and outside. Sweetie Belle eagerly trotted over towards the buckets she'd already brought out, where there were rags hanging over the sides. And, of course, the rag that had fallen out of the spilled bucket. She took up the wet rag and folded it nice and neat in half, then in half again, then set up on the far side of the puddle. She put her front hooves on the rag, crouched down eagerly, her tail up. Then she ran across the puddle, sending up a small wave across the puddle as she pushed the water ahead of her with the rag. Halfway across one of her rear hooves *slipped* slightly and she almost stumbled, but she recovered before she hit her chin on the floor and kept going, so that she send a lil' splash of water out the door. She wrung her rag out into the flower beds and came back in to try again! Yay! She was helping! * * She was helping and not making a mess! She smiled over to Scootaloo to share her happiness with her friend, then grinned up at her sister. Sure, an adult would recognize that she was putting *way* too much effort into this, but Sweetie was just delighted to be helping!